So today we learn about another surfactant-combination we easily find in shampoos: combination of glucosides! The glucosides are a wide variety of NON-IONIC (this means they don’t have “electric charge”) surfactants which are usually easily biodegradable; therefore many bio-shampoos contain this combination of surfactants. The most common glucosides which you will find in an INCI are: Lauryl Glucoside, Decyl Glucoside, Coco Glucoside, and Caprylyl/Capric Glucoside. They are considered to be not aggressive on the scalp (but you always need to bear in mind that this is not a defining thing: an aggressive surfactant found in a shampoo which is well formulated won’t result in making the shampoo aggressive… and a not so aggressive surfactant used in a badly formulated shampoo, can result in making the shampoo aggressive! 😀 ), Non-ionic surfactants are also good solubilizers, some more than others (for example the Caprylyl/Capric Glucoside) and this is why they are normally used when the formulation contains oils. The fact that they are non-ionic makes them more suitable for delicate scalps. For this reason and also for the fact that usually they have a “natural origin” (compared to the synthetic origin of many other surfactants), they are normally used in products intended for kids and babies. The glucosides are less conditioning than the SLES+betaine combination, however this can be easily helped by adding some conditioning ingredient in the shampoo. In an INCI of a shampoo made with these surfactants, we simply expect to find at least a few of them (just because usually the more the number of surfactants, the milder the result); most of the shampoos with these surfactants are eco-friendly. If a brand decides to use a combination of glucosides in a shampoo, it is probably because they want to point to attract the eco-friendly consumers. In fact using SLES would be generally cheaper and it would give a good result more easily (with a more simple formulation). We can also find glucosides in formulations to mild down anionic surfactants (SLES for instance). In this case the base surfactant (the one used at the highest concentration) is anionic and the non-ionic surfactants are used only to make the shampoo milder. INCI: Water, Disodium Cocopolyglucose Citrate, Caprylyl/Capryl Glucoside, Sodium Lauroyl Sarcosinate, Sodium Lauroyl Glutamate, glycerin, Sodium Chloride, Yucca Schidigera (Yucca Vera), Betula Alba, Urtica Dioica, Rosmarinus Officinalis, Chamomilla Recutita, Acetum. INCI: Aqua, Coco Glucoside, Lauryl Glucoside, Sodium Cetearyl Sulfate, Decyl Glucoside, Glyceril Oleate, dicaprylyl Ether, Arctium lappa extract, Moringa pterygosperma extract, Dextrin, Aloe barbadensis leaf extract, Glycerin, Mel, Citrus medica limonum oil, Cedrus atlantica oil, Eucalyptus citriodora oil, Pelargonium graveolens oil, Melaleuca alternifolia oil, Lavandula hybrida oil, Thymus serpillum oil, Lactic Acid, Polygliceryl 2-Dipolyhydroxysearate, Potassium Sorbate, Sodium Benzoate, Limonene, Citral, Citronellol, Geraniol. I don’t seem to have been able to find a bad bad INCI with these surfactants, so, please, if you find a shampoo which seems to have a bad INCI and contains these surfactants please let me know 🙂 I will be happy to check! My question: can you give us a list of all the bad ingredients and why they are bad? Even if you don’t like them due to personal opinion (like the PEG ones), please let us know why it is an undesired ingredient. Please and thank you! Great articles. I do have lots of Decy Glucoside and CAPB around lolz. However I also find that Decylglucoside doesnt have good wetting capabilities lke SLES and thus it does not give good feeling on hair. What do you think about this and a combination of Glucosides & Cap Betaine only? However… Using always sles based shampoos tends to irritate my scalp after a while so I tend to switch sles-based and glucosides-based. The “problem” sometimes is how to thicken them up (sclerotium gum maybe?) or how to make them more performing. So try and enjoy 🙂 you will be happy!! You are right about making a great shampoo ha ha. It is hard to avoid sulfate surfactant but only buy from locals 😀 . Hey! Thank you so much for your wonderful blog 🙂 I have learned so much from you and frequently refer readers to your site! I read in your guide to formulating a detergent that non-ionic surfactants “are usually not used in shampoos because they don’t leave a comfortable feeling on the hair (it makes them feel dry) unless they are included in the formulation in small amount (and therefore they work more as foam stabilizers)”, but here we have quite a few shampoos that use non-ionic surfactants as the primary surfactants in the surfactant blend, and you’ve analyzed them favourably. I was hoping you could elaborate 🙂 Cheers! 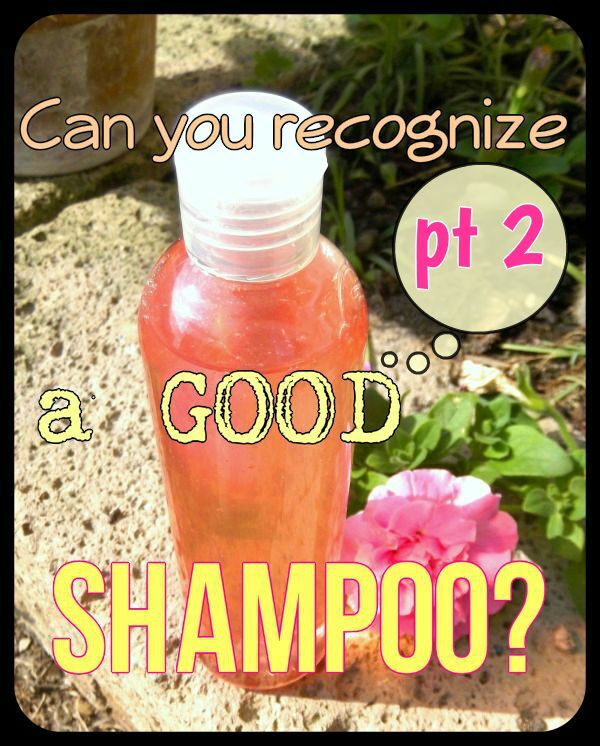 The most comfortable shampoos do contain non-ionic. For example I have never found for my long hair a good eco-friendly shampoo from the point of view of their performance… But they were “good” from the point of view of the INCI.